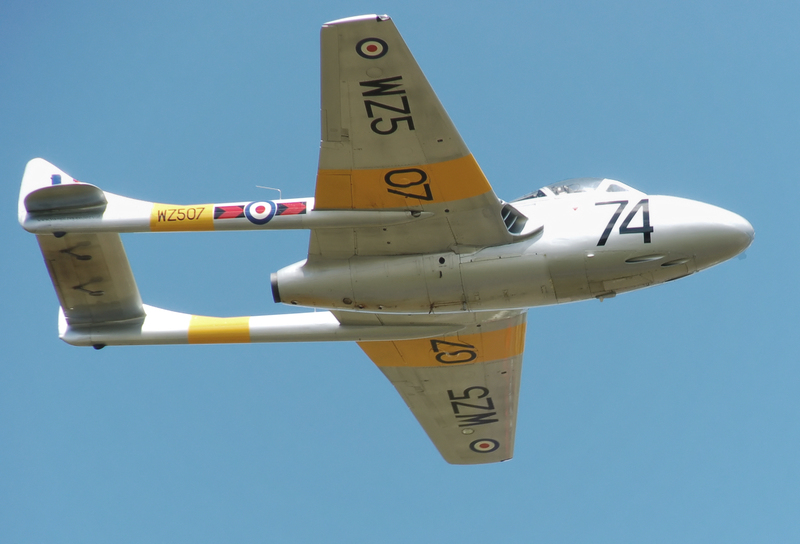 Part two of the Warbird Tails jets series takes a look at the other British jet which took its first flight in 1943, the de Havilland Vampire. In the early days of Jet power, two engines were considered to be the minimum for succesful designs. 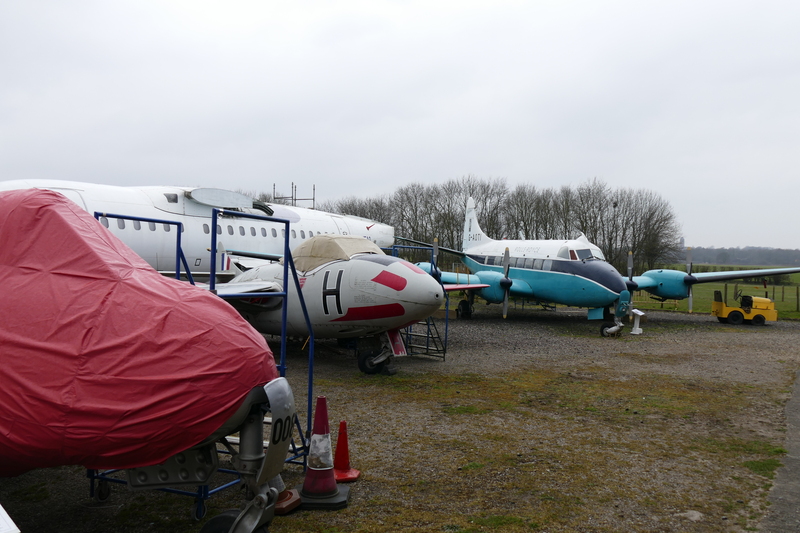 This is evident in a number of the early jet aircraft such as the Meteor and ME262. Their first effort at this new design was given the designation of DH.99 and it was of all metal construction, with tricycle undercarriage and a distinctive twin boom profile. The twin boom design wasn’t just for show, though it does make for a distinctive profile, it also allowed the engine to have as short a jet pipe as possible, thus minimising any loss of power. The design was soon changed to incorporate wooden parts, largely the “fuselage” pod area, this seemed an obvious choice for de Havilland, following their success with wooden designs in the Mosquito. With this re-design the new fighter was dubbed the DH.100. Another T.11 is seen in the centre of this image, with the Vampires descendant, the Venom in the foreground. Two years on from the initial design work for the Meteor, the same work began on the DH.100 at Hatfield. On the 20th September 1943, Geoffrey de Havilland Jr took prototype LZ548/G up for the types first flight. Considering the late start in comparison to the Meteor design, the two types first flights were only 6 months apart. However, with the Vampire being a much more experimental design, it took de Havilland much longer to get to the stage of production runs, partly due to difficulties with the Goblin engine. Issues with over sensitive controls also slowed the development of the time and the stall was found to be quite abrupt. 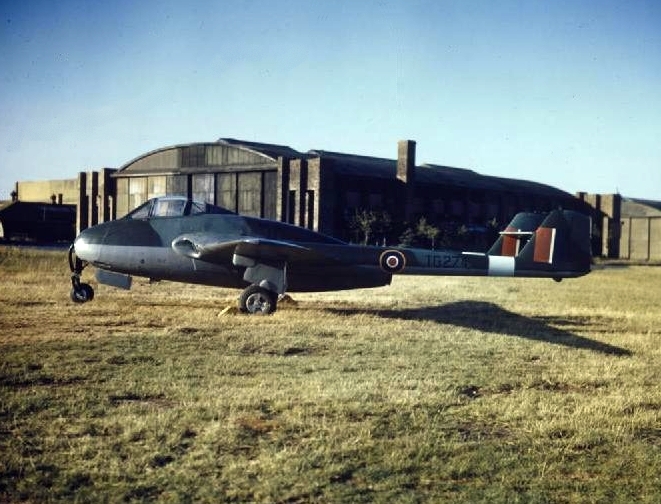 The First RAF F1 Vampire at Boscombe Down in 1945. The first production Vampires didn’t start rolling off the production line until April 1945 and were not ready for front line service until after the war had finished, leaving the Meteor to be the only British Jet to see war service. Shortly after coming into service it was found that the Goblin power plant gave the new design a disappointingly short range, though these range issues were soon fixed in later Mks. Post war the Vampire was largely used in a ground attack / fighter bomber role. The first variant to receive the designation of fighter bomber was the FB.5, which was developed from the F.3 model. This type first flew in 1948 and was powered by a Goblin III. The FB.5 proved to be a very popular version, with 19 RAF Squadrons operating the type in Europe, the Middle East and the Far East. 473 examples of this type were produced, making it the most numerous single seat example. A Flight of Vampires – Image Source. de Havilland entered into a private venture once the Vampire was suitably established, they wanted to create a night fighter version of the Jet, with a view to exporting to the Egyptian Air Force. This followed the same basic design, though this time it would be fitted with a two seat cockpit, closely modelled on that of the Mosquito. Sadly for de Havilland however the government blocked the export to Egypt as part of an ongoing trade ban with the nation. This bad luck was followed by a stroke of the opposite however, as the RAF agreed to take over the order to bridge the gap between the Mosquito and the Night Fighter version of the Meteor. 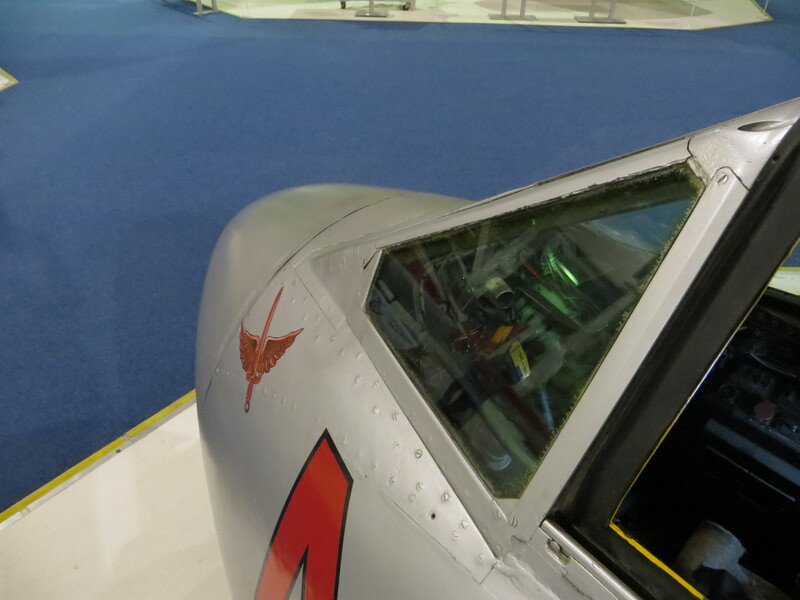 A look over the nose of the RAF Museum’s single seat Vampire. 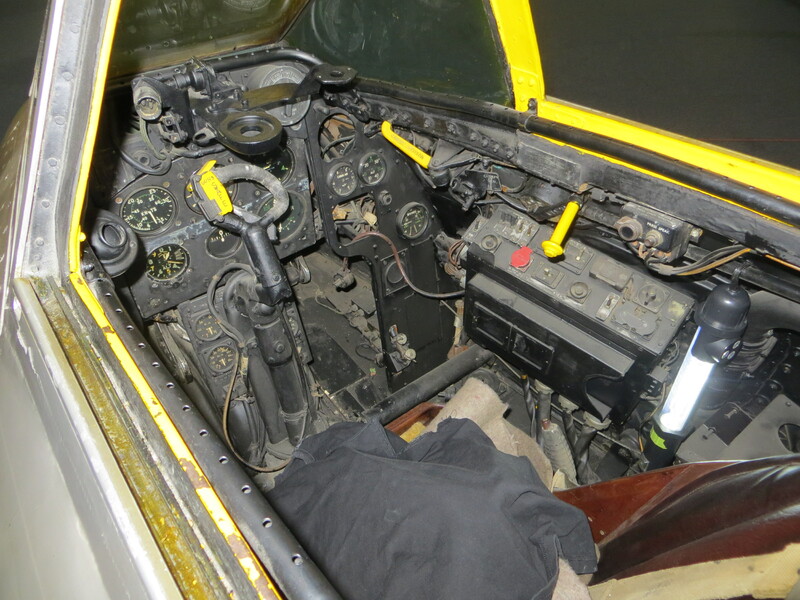 Once the night fighter duties were no longer required the radar units were removed and dual controls were installed, creating the Vampire T.11, which went on to become a common training aircraft for the RAF and other nations around the world. On the subject of exports, the Vampire proved to be a hugely successful aircraft in this respect, over 31 countries eventually having Vampires on strength. One important claim to fame that the de Havilland jet has, is being the first jet aircraft to take off and land from an aircraft carrier. This event took place when Captain Winkle Brown flew a Sea Vampire on the 3rd December 1945, landing and taking off from the deck of HMS Ocean. Another interesting piece of exploratory work that the type was used for was the idea of rubber deck carriers. This idea followed the principle of aircraft without undercarriage which could land on a soft, flexible deck. Many successful flights were made using this novel idea both on airfields and carriers, but ultimately the idea was not taken any further. As with many aircraft that are among the first of their kind, they can be superseded very quickly and this remained the case with the Vampire. 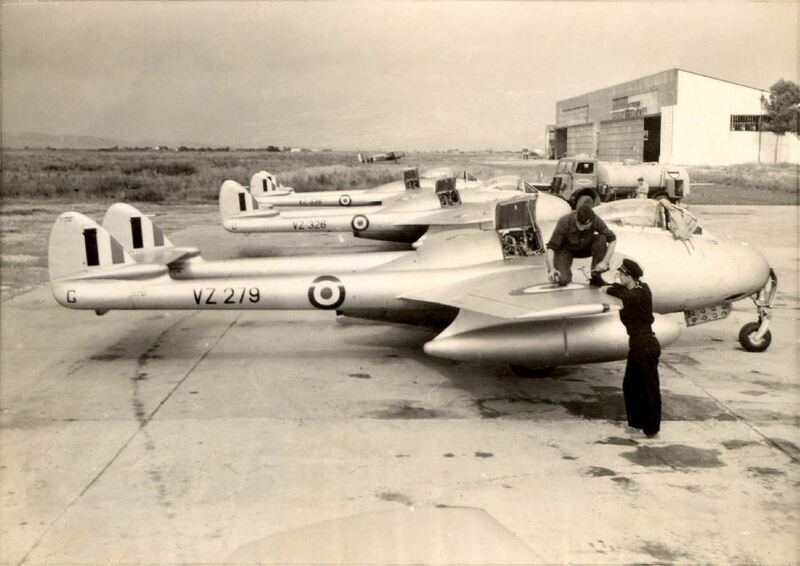 As touched on above by the mid 1950s the RAF had pushed the Vampire into a training role and by the end of the decade the type had been heavily withdrawn from service. This example is operated by the Classic Air Force and is based out of Coventry. Though actually a Swiss T.55 built in 1958, the aircraft was put up for sale in 1991 and was ferried to the UK later that year. Once the aircraft arrived in the UK, specifically at Bournemouth, it was painted in fictional RAF camouflage. ‘215 was acquired by Air Atlantique in 2004 and remains active at airshows to this day. The second survivor is based out of North Weald and is a T.11, built in 1952. After delivery in 1953, ‘507 remained in RAF service until 1969, being sold to the Soloway Aviation Society at Carlisle. 11 years later she was placed on to the Civilian register as G-VTII, the first ex RAF jet to be added, having been restored to airworthy condition ‘507 passed through a number of owners in the intervening years before ending up with the Vampire Preservation Group, who have operated her since 2005. 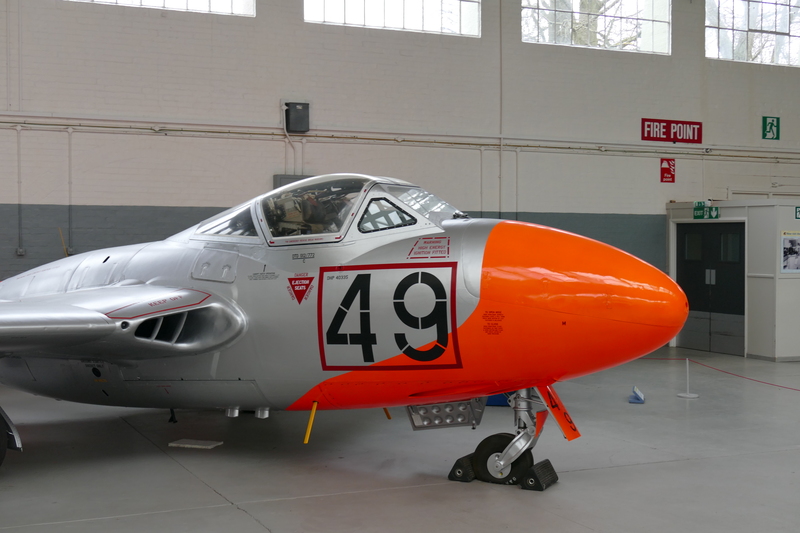 The aircraft is now based at North Weald and wears the familiar silver with yellow bands training scheme that many Vampires would have worn on training duties. This scheme is paticulalry evocative as it hails back to the glory days of the Vintage Pair display team, which consisted of a Vampire T.11 and Meteor T.7, both resplendant in this silver and yellow scheme. Many other airworthy survivors remain around the world as well, with a notable pair operated in Norway, both of which often visit the UK during the summer months. Ultimately the Vampire came to fruition too late to make an overly lasting impression as a fighter aircraft, perhaps if some of the initial problems had been rectified quicker and the aircraft had joined the front lines before the war came to an end like the Meteor, than it may have been a different story. None-the-less the Vampire is an incredible piece of design and one of the first single engined jet aircraft to make it into production, it also proved to be an excellent training machine giving countless pilots much needed experience in jet powered flight. All this without mentioning the huge leaps that the aircraft made for naval aviation. We are very lucky to still have a few examples of this wonderful de Havilland design still flying in the UK.